DIE Mercurii, 12 die Decembris. D. of Bucks' Claim to the Title of L. Roos, versus E. Rutland. His Petition to the King. Report concerning the Title of L Roos. Mangie, Servant to the D. of Bucks, arrested. Burwell, Carter, &al. sent for. Hodie 1a vice lecta est Billa, "An Act for the Improvement of the Forest of Delamer." A Message was brought from the House of Commons, by Sir Gilbert Gerard and others; who brought up a Bill, intituled, "An Act for improving the Lead Mines in the County Palatine of Durham, granted to Humphrey Wharton Esquire for Three Lives." 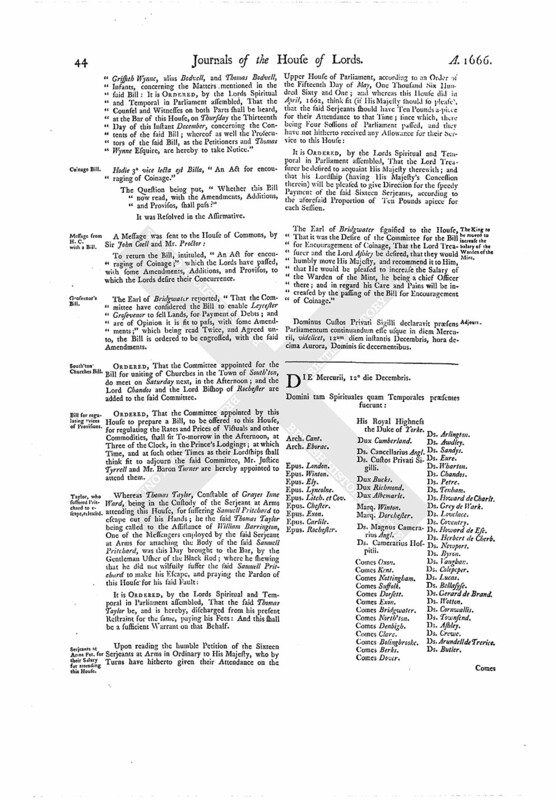 The House being made acquainted, "That the Duke of Bucks, upon Petition, hath obtained His Majesty's Reference to this House, concerning the Claim to the Title of Lord Rosse:"
"The humble Petition of George Duke of Bucks, Baron Ross, of Rosse, Hamlak, Tresbut, and Belvoire, &c.
Your Petitioner humbly prayeth, Your Majesty will be graciously pleased to refer the Consideration and Determination thereof to Your House of Peers. "At the Court at Whitehall, December 10th, 1666. "His Majesty is graciously pleased to refer the Consideration of this Petition, and the Determination of the Controversy therein expressed, to the Right Honourable the House of Peers; who are to do in it as their Lordships shall find just and fit. Upon reading the humble Petition of George Duke of Bucks presented to the King's Majesty; shewing, That John Mannors, Eldest Son of the Earl of Rutland, makes a Pretence to, and calls himself by the Name of, Lord Rosse, which Title the said Duke of Bucks lays Claim to as solely belonging to him; and His Majesty's Reference made thereupon to this House for the Determination of the Controversy therein expressed: It is thereupon ORDERED, by the Lords Spiritual and Temporal in Parliament assembled, That, on Monday the One and Twentieth Day of January next, this House will hear Counsel on both Parts, at the Bar, concerning the same; and that the Earl of Rutland is to have timely Notice thereof. The Lord Chamberlain reported, "That the Committee (to whom it was referred to endeavour to find out some Expedient as might satisfy all Parties concerning the Title of Lord Rosse) have endeavoured what they can, and find no Expedient; therefore the Committee return the Business to this House." 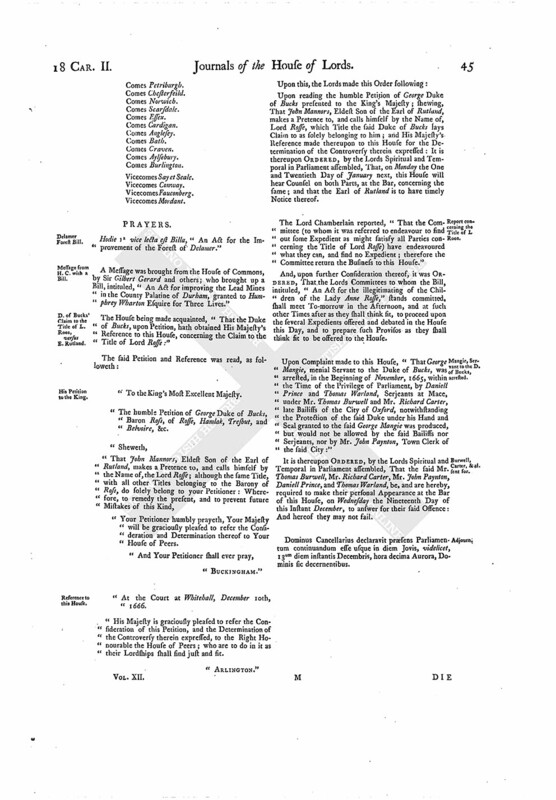 And, upon further Consideration thereof, it was ORDERED, That the Lords Committees to whom the Bill, intituled, "An Act for the illegitimating of the Children of the Lady Anne Rosse," stands committed, shall meet To-morrow in the Afternoon, and at such other Times after as they shall think fit, to proceed upon the several Expedients offered and debated in the House this Day, and to prepare such Provisos as they shall think fit to be offered to the House. Upon Complaint made to this House, "That George Mangie, menial Servant to the Duke of Bucks, was arrested, in the Beginning of November, 1665, within the Time of the Privilege of Parliament, by Daniell Prince and Thomas Warland, Serjeants at Mace, under Mr. Thomas Burwell and Mr. Richard Carter, late Bailiffs of the City of Oxford, notwithstanding the Protection of the said Duke under his Hand and Seal granted to the said George Mangie was produced, but would not be allowed by the said Bailiffs nor Serjeants, nor by Mr. John Paynton, Town Clerk of the said City:"
It is thereupon ORDERED, by the Lords Spiritual and Temporal in Parliament assembled, That the said Mr. Thomas Burwell, Mr. Richard Carter, Mr. John Paynton, Daniell Prince, and Thomas Warland, be, and are hereby, required to make their personal Appearance at the Bar of this House, on Wednesday the Nineteenth Day of this Instant December, to answer for their said Offence: And hereof they may not fail. Dominus Cancellarius declaravit præsens Parliamentum continuandum esse usque in diem Jovis, videlicet, 13um diem instantis Decembris, hora decima Aurora, Dominis sic decernentibus.